26 | 26 | FVoisit r m reor nt e i on nfhoirst ma or tiyo.or n agb o our c t t al hl 4 e R25. ent 25 o5. n H2i3st 3o0ry Museum 425-255-2330 visit www.rentonhistory.org 235 M I LL AV E . S. R E N TO N , WA 98057 425-255-2330 W W W. R E N TO N H I S TO RY.O R G One block south of the Renton Library. M US EUM H O U R S TUESDAY–SATURDAY, 10AM–4PM Closed July 30–Aug 4 AD M I SS I O N Programs free with the price of admission Adults $5 Students/ Children $2 Children 8 and younger FREE RHM Members always free Free Admission on the first Wednesday and the third Saturday of the month. 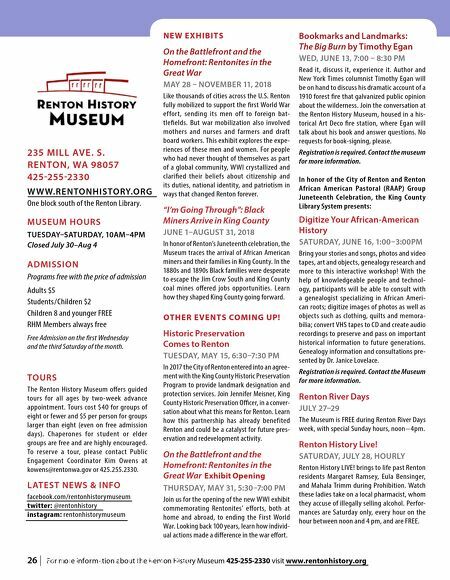 TO U R S The Renton History Museum offers guided tours for all ages by two-week advance appointment. Tours cost $40 for groups of eight or fewer and $5 per person for groups larger than eight (even on free admission days). Chaperones for student or elder groups are free and are highly encouraged. 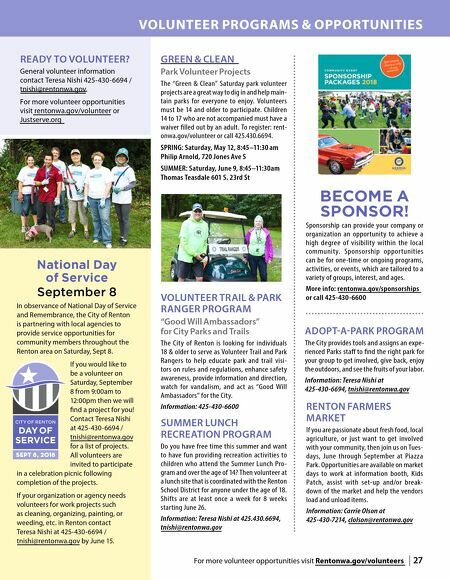 To reser ve a tour, please contac t Public Engagement Coordinator Kim Owens at kowens@rentonwa.gov or 425.255.2330. L AT E S T N E WS & I N FO facebook.com/rentonhistorymuseum twitter: @rentonhistory instagram: rentonhistorymuseum N E W E X H I B I T S On the Battlefront and the Homefront: Rentonites in the Great War MAY 28 – NOVEMBER 11, 2018 Like thousands of cities across the U.S. Renton fully mobilized to support the first World War ef for t, sending its men of f to foreign bat- tlefields. But war mobilization also involved mothers and nurses and farmers and draf t board workers. This exhibit explores the expe- riences of these men and women. For people who had never thought of themselves as part of a global community, WWI crystallized and clarified their beliefs about citizenship and its duties, national identity, and patriotism in ways that changed Renton forever. "I'm Going Through": Black Miners Arrive in King County JUNE 1–AUGUST 31, 2018 In honor of Renton's Juneteenth celebration, the Museum traces the arrival of African American miners and their families in King County. In the 1880s and 1890s Black families were desperate to escape the Jim Crow South and King County coal mines offered jobs opportunities. Learn how they shaped King County going forward. O T H E R E V E N T S CO M I N G U P! Historic Preservation Comes to Renton TUESDAY, MAY 15, 6:30–7:30 PM In 2017 the City of Renton entered into an agree- ment with the King County Historic Preservation Program to provide landmark designation and protection services. Join Jennifer Meisner, King County Historic Preservation Officer, in a conver- sation about what this means for Renton. Learn how this par tnership has already benef ited Renton and could be a catalyst for future pres- ervation and redevelopment activity. On the Battlefront and the Homefront: Rentonites in the Great War Exhibit Opening THURSDAY, MAY 31, 5:30–7:00 PM Join us for the opening of the new WWI exhibit commemorating Rentonites' effor ts, both at home and abroad, to ending the First World War. Looking back 100 years, learn how individ- ual actions made a difference in the war effort. Bookmarks and Landmarks: The Big Burn by Timothy Egan WED, JUNE 13, 7:00 – 8:30 PM Read it, discuss it, experience it. Author and New York Times columnist Timothy Egan will be on hand to discuss his dramatic account of a 1910 forest fire that galvanized public opinion about the wilderness. Join the conversation at the Renton History Museum, housed in a his- torical Art Deco fire station, where Egan will talk about his book and answer questions. No requests for book-signing, please. Registration is required. Contact the museum for more information. In honor of the City of Renton and Renton African American Pastoral (RAAP) Group Juneteenth Celebration, the King County Library System presents: Digitize Your African-American History SATURDAY, JUNE 16, 1:00 –3:00PM Bring your stories and songs, photos and video tapes, art and objects, genealogy research and more to this interactive workshop! With the help of knowledgeable people and technol- ogy, participants will be able to consult with a genealogist specializing in African Ameri- can roots; digitize images of photos as well as objects such as clothing, quilts and memora- bilia; convert VHS tapes to CD and create audio recordings to preserve and pass on important historical information to future generations. Genealogy information and consultations pre- sented by Dr. Janice Lovelace. Registration is required. Contact the Museum for more information. Renton River Days JULY 27–29 The Museum is FREE during Renton River Days week, with special Sunday hours, noon – 4 pm. Renton History Live! SATURDAY, JULY 28, HOURLY Renton History LIVE! brings to life past Renton residents Margaret Ramsey, Eula Bensinger, and Mahala Trimm during Prohibition. Watch these ladies take on a local pharmacist, whom they accuse of illegally selling alcohol. Perfor- mances are Saturday only, every hour on the hour between noon and 4 pm, and are FREE.